A Hawaiian Airlines flight heading to New York was diverted to the San Francisco International Airport Thursday night following a medical emergency that lead to the death of a flight attendant. Kris Sanchez reports. Flight 50 left Honolulu at 4:20 p.m. and was headed to John F. Kennedy International Airport when was it re-routed to SFO around 1 a.m. Friday after a flight crew member experienced a suspected heart attack, a spokesperson for SFO Doug Yakel confirmed. 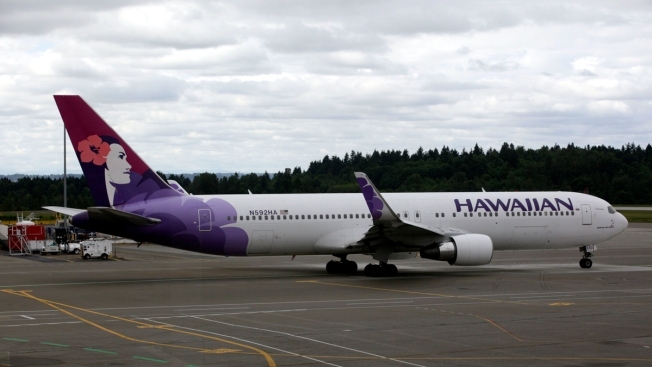 Hawaiian Airlines identified the crew member as flight attendant Emile Griffith, who has been with the airline for 31 years. "We are forever grateful for Emile's colleagues and good Samaritans on board who stayed by his side and provided extensive medical help. Emile both loved and treasured his job at Hawaiian and always shared that with our guests," the airline said in a statement. One passenger, author Andrea Bartz, sent out a series of tweets saying flight attendants made an announcement calling for any doctor on board to help. "It’s been a long time since they asked for doctors to come to first class so I hope they’re okay," Bartz tweeted. Yakel said that qualified medical personnel were attempting CPR onboard but the efforts stopped prior to landing at the San Francisco airport. "The San Mateo County Coroner declared the flight crew member deceased on arrival at SFO. Passengers were re-accommodated on other flights," Yakel said in a statement. The flight, which initially carried 253 and 12 crew members, was seen leaving San Francisco before 5 a.m.